Seems Taylor Swift have learnt how to make money off her numerous breakups, the singer has finally managed to pull off another coup, making money off it. 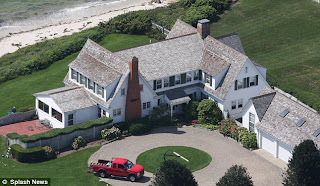 The singer had purchased a $4.8 million dollar mansion at Hyannis Port in Massachusetts next to her ex-boyfriend's house last year while she was saying Conor Kennedy. After tge relationship went south she sold the house for $5,675,000, thereby making a profit of $875,000.